In addition to providing extensive and diversified prize coverage programs, Hole-In-Won.com further expands its capabilities by offering a variety of supplemental options (and amenities), available at YOUR discretion. Put additional excitement in your next event by setting up one of our fabulous chipping competitions: From 20' to 100', hole out a chip shot and win Cash, Cars, Vacations and MORE! Put additional excitement in your next event by setting up one of our bunker shot competitions: From Greenside to 100 yards, hole out a sand shot and win Cash, Cars, Vacations and MORE! Have your players try to make a 20' putt, 40' chip shot and a greenside bunker shot. Hole out 2 out of three and win a grand prize. Closest total distance to the hole wins a sponsored prize, also! For fund raising, have your players donate an entry fee with ½ of the pot going to your charity and ½ going to the winner. All three share closest to the hole (by measuring) if there's no winner! This is an exciting addition to ANY golf event - especially charity and fund raising events! Having the option of an additional shot(s) for ANY of our Hole-In-One awards may be just the ticket to success for any player - and it's definitely a winning addition for any charity or fund raising event. VOLUNTARY participation - doesn't cost your event ONE DIME! Net proceeds donated directly to beneficiary. 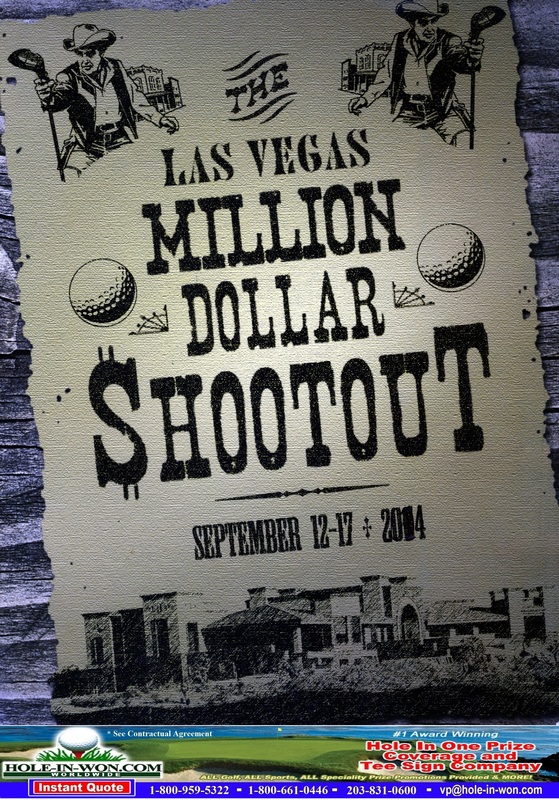 Gather your Closest-to-the-pin Winners, Long Drive Winners, Blind Draw (and other) Winners, for one final shot at your event's Hole-In-One grand prize OR have them take a pop at any award you desire - up to $2,000,000!!! We offer the lowest pricing arrangements on shootouts. 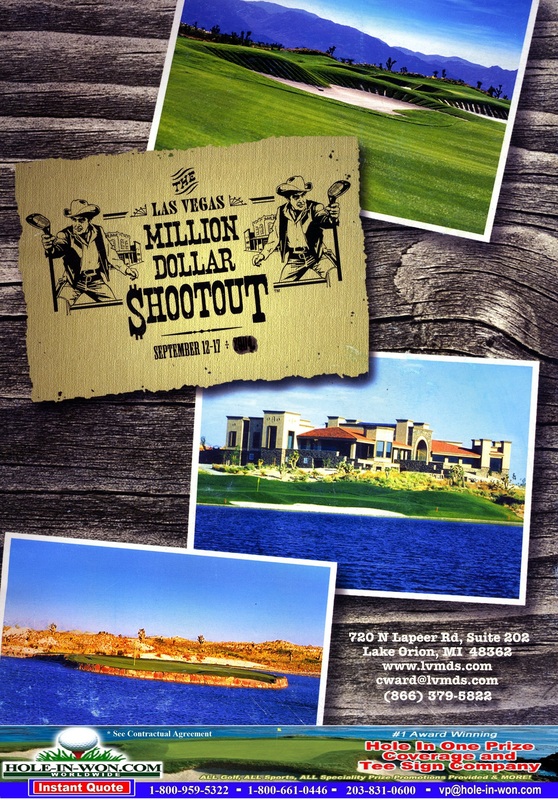 Click to learn how a MILLION DOLLAR SHOOTOUT works! Circles around the pin, from one-foot to three-foot, and larger. Put a shot inside the circle and win Golf Vacations, Pro Shop Merchandise, Airline Ticket Packages AND MORE! MORE THAN ONE HOLE ON A GREEN Hole-In-Won.com will insure multiple prize holes on the same green. We've insured 18 holes on one green! Insure Double Eagles for your event, just as you would a Hole-In-One for Golf Vacations, Pro Shop Merchandise, Airline Ticket Packages AND MORE! 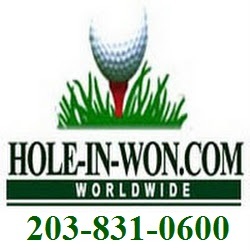 Hole-In-Won.com can formulate one of two programs. We can insure any hole you'd like for an Eagle or, on a Par 5, mark a circle and any player making the putt from that location wins Cars, Cash, Pro Shop Merchandise Airline Ticket Packages AND MORE! 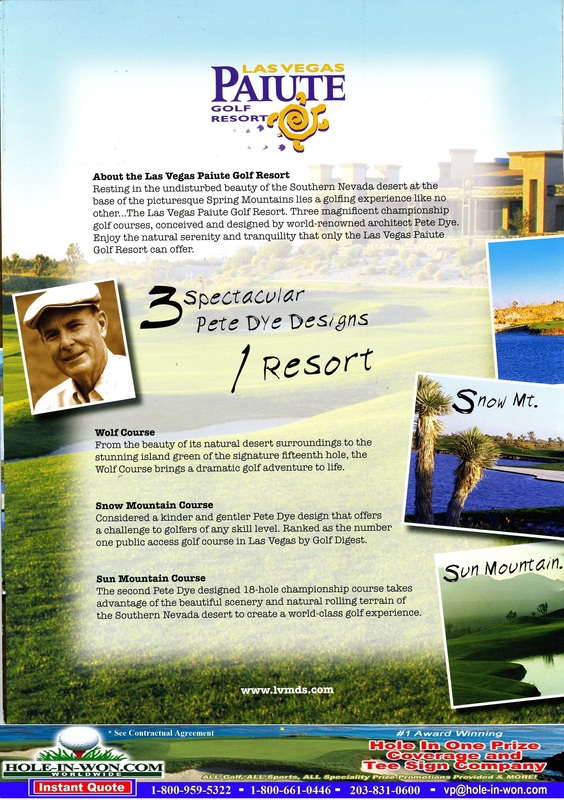 Hole-In-Won.com can arrange to insure one or more holes in your event through our exclusive Birdie Program. We can offer three possibilities: Hole-In-Won.com can insure any hole(s) for a Birdie, just as you would for a Hole-In-One OR, on any hole, mark a circle on the green - player(s) making the putt from that location win OR One or more holes can be involved, ie.. Players who Birdie #9 & #15 can win. This is only limited by your imagination! Raise additional funds through your charity or fund raising golf event by utilizing one (or more) of Hole-In-Won.com's fabulous programs or options. 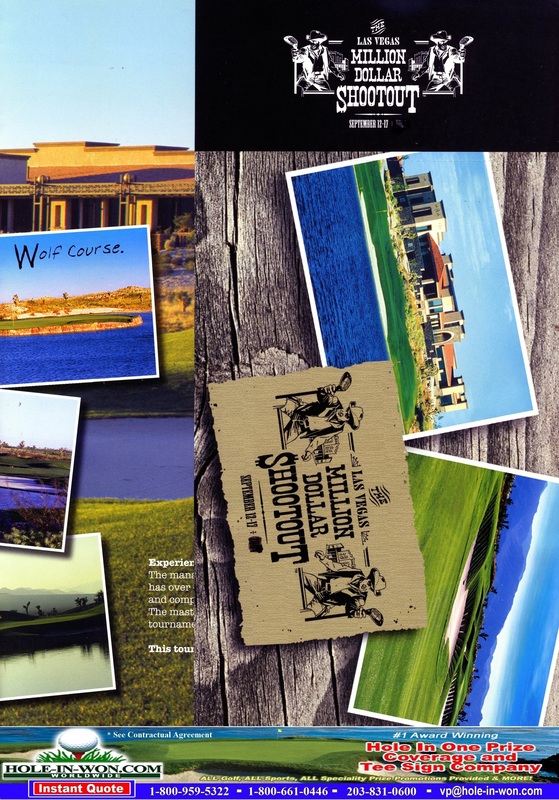 Though Hole-In-Won.com considers its many programs and options to be worthwhile 'drawing cards' for any event, you may find many of our unique options favorable to your situation. Hole-In-Won.com is the ONLY Hole-In-One insurer to have donated ''Tens of Thousands'' of dollars to help support local and national charities and fund raisers. Hole-In-Won.com offers up a fabulous program for insuring cash awards and saves you premium dollars in the process! Annuity maintenance sum payable yearly at regular intervals. Savings up to 40%! Hole-In-One Cash Awards of $10,000 or more. Insure through Hole-In-Won.com for annuity periods of two years or longer. This is NO COMPROMISE coverage, you still get Hole-In-Won.com's comprehensive prize coverage package. These will save you up to 40% on your premium. Insure your Hole-In-One vehicle on a two year, three year, or longer leasing program. Premuim is based on vehicle value and lease structure. Display a higher profile vehicle AND save premium dollars in the process. SAVE additional dollars if Hole-In-Won.com can arrange Lease Annuity v. Lump Sum payments. Hole-In-Won.com's fabulous coverage (of ANY award) starts at an unbelievable 95 Yards! Hole-In-Won.com also makes appropriate adjustments in all prize hole yardages for female participants - depending on the prize coverage program provided. Additional yardage adjustments may be allowable in certain circumstances, usually at no additional cost. Independent witness' NOT available for your event! Let us draw up a witness waiver for you. Players in the event handle ALL witnessing responsibility. Supplementary awards do NOT require independent witnesses.